Ahhhh contouring! I love this technique so much to create defined cheekbones. What i dislike however, is over contouring. It's just not necessary for everyday life! Honestly, a few quick tricks and you can instantly create slight illusions that help you look your best without going too far! 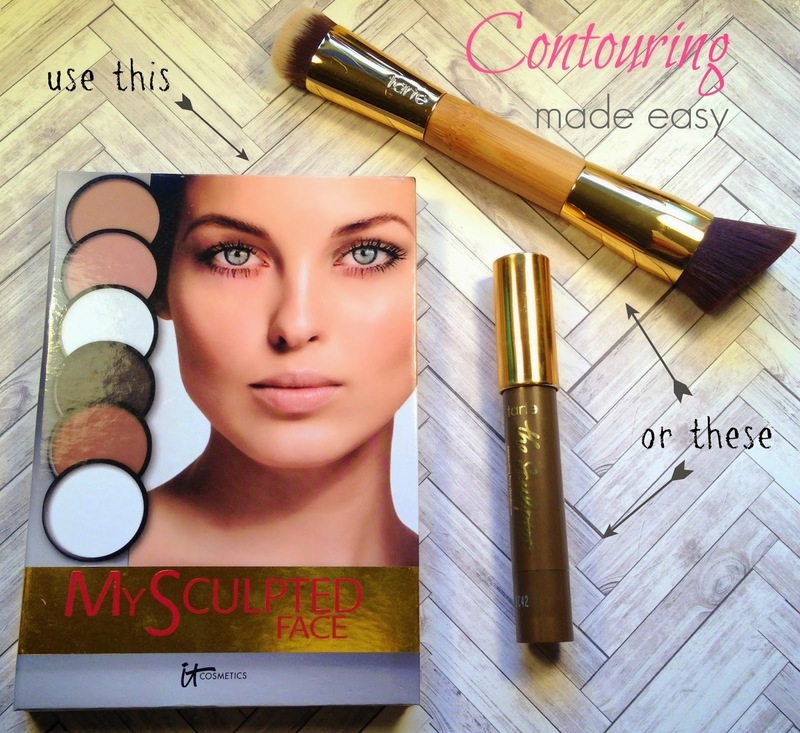 I wanted to show you some of my favorite contouring tools! I purchased the IT Cosmetics My Sculpted Face a few month back and have been loving the variety of options here. You can use one of the bronzer shades that best suits your skin tone, or mix colors to create the best shade for you. There are two highlighting shades, one with a slight shimmer and one matte which i LOVE! Honestly, this palette is your one stop shop to contouring. Whether you want to apply just a few of the techniques, or go all out... this palette works! Oh and bonus? It comes with a cheat sheet making application practically fool proof! When i heard of Tarte's The Sculptor contouring stick i was instantly intrigued! For my purposes, i knew this beauty had plenty of potential. When i finally got around to purchasing it, i quickly put it to the test. Wow... it worked beautifully! The color was absolutely perfect for my skin! I applied it on the hollows of my cheeks to define my cheekbones and immediately took notice of this minor yet very powerful change to my face. Will this shade work for everyone? I can only attest to the fact that it worked really well for my particular skin tone. A few weeks later, i picked up this uhhhhhmazing Tarte Contouring Brush and was instantly wow'd by how well it worked. Seriously, this brush is the perfect compliment to The Sculptor contouring stick as it helps to blend the product in creating the most natural look. Overall, you don't need much when it comes to contouring. Just arm yourself with a few great tools and you are all set! BTW have you entered my GIVEAWAY for a Tarte Rainforest After Dark Palette? Just a few days left! Open Internationally! Enter here!